It has several craters, namely Gumuruh, Gede, Sela, Ratu, Lanang, Wadon and Baru located on the peak areas that form the straightness along 1000 m. It extends from north-northwest direction. Gede Crater is located on the northwest side of Gumuruh crater, while Kawah Ratu and Lanang Crater are in the south of Gede crater. Wadon crater is a fumarola area located near the northern part of Gede that disappears. Mount Gede is covered by mountain forests, which include the submontana, montane, and subalpine zones around its peak. Mountain forest in this region is one of the most rich types of flora in Indonesia, even in the Malesia region. So make it as the location of research objects. Recorded in 1819, C.G.C. Reinwardt as the first person to climb Mount Gede, then followed by F.W. Junghuhn (1839-1861), J.E. Teijsmann (1839), A.R. Wallace (1861), S.H. Koorders (1890), M. Treub (1891), W.M. Docters van Leeuwen (1911); and C.G.G.J. van Steenis (1920-1952) has made a collection of plants as the basis for the preparation of The Mountain Flora of Java published in 1972. Gunung Gede also has a diversity of ecosystems consisting of submontana forest formations, montane, subalpin; as well as lake, swamp, and savanna ecosystems. 1955 == 21 July (Djatikoesoemo, 1955). August 2, at 00:20 Thick thick black smoke appears to spray as high as 300 – 400 m (Djajawinangun, 1955). 1956 == 28 April, at 07.00, there was a thick black ash cloud accompanied by rays, lasting half an hour (Hadikusumo, 1957). 1957 == 13 March, at 1914 – 19.16 eruptions accompanied by a roar, eruption cloud height of approximately 3 km above the crater (Hadikusumo, 1957). 1972 == According to Hamidi (1972, p.3) in July Lanang Crater gives off a thick, white smoke that smells of sulfur sounds sizzle. The location where this carbon copy has shifted approximately 10 meters. In Kawahratu copper fumarola is on the north cliff, the smoke is white with weak pressure. The bottom of the crater is covered in mud. At Kawawadon, a copy of fumarola is in the southeast corner, smelling of thin, white sulfur with low pressure. There is no striking crater change. Mt Gede is a strato volcano. The slopes of the mountain flourish toward the south and southeast. In the western and northern parts, this mountain is bordered by Mount Pangrango which forms a twin volcano with Mount Gede. In the other direction, this volcano is limited by the old volcano complex. The southern slopes are more steep compared to other slopes, showing rough topography and deep erosion slices. This may be due to the movement of volcanic activity towards the north, towards the young sediment. The form of volcanic origin (remnants of the crater / slope and slope incision on the volcanic sediment), the forms of volcanic denaturation (Mount Joglo and Telaga), the forms of origin of the denudation (Gunung Kencana), and the forms of origin of the structure (lava ridge ). The semicircle characterizes the remainder of the crater, which opens to the northwest and has a very steep wall. The top of the crater is the steepest with a height of 50-200 m and a diameter of 1600 m. The crater is formed by the sequence of the teralterated and pyroclastic lavas. Mount Gede’s active crater is characterized by a horseshoe form that opens to the north. Very steep walls have a height and a diameter of 200 m and 1000 m respectively. There are 5 pieces of young crater that is in the bottom of Gede crater, Mount Joglo and Mount Telaga has a cone shape that has eroded strongly with a sharp ridge. Breksiasi associated with deep erosion and escarpings may be caused by cesarean delivery. Mount Joglo and Mount Telaga are in the northern part of Gunung Gede, formed by the old volcanic debris flow. Mount Kencana is formed by lava that has been weathered. The lava ridge is characterized by a ridge that extends with the escarp along the sides of the ridge and lies on the more northern part of Mount Gede. Gumuruh crater; is the largest and the oldest crater, with a diameter of 1600 m, this crater has a horseshoe-shaped crater that leads to the northwest with a very steep crater wall has a height of about 200 m and a narrow flat crater base. Crater Gede, located in the crater Gumuruh with a diameter of 1000 m, the steep wall has a height of 200 m, the crater opens to the north. Sela Crater, located on the north side of the crater crater Gede with a diameter of 750 m. The crater side is not visible due to the younger eruption. Crater Queen, has a diameter of 300 m and a steep wall, located in the crater Gede. Lanang crater, an active crater with size 230 x 170 m and the crater wall is very steep. New Crater, located inside Kawah Gede. Wadon Crater, located in the northern part of Gede crater with size 149 x 80 m, is characterized by the presence of field solfatara and fumarola. At present the most active crater is the Lanang Crater and Wadon Crater. 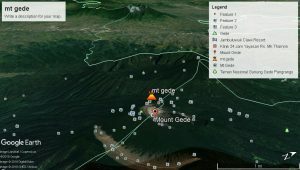 The geology of the MtGede complex is divided into three periods of activity: Mount Masigit Pangrango, Mt Gumuruh (Old Mount Gede) and Mt Gede Young. The bedrock of this complex and the surrounding area are tertiary tertiary sedimentary rocks, the volcanic deposits from the young Gede Mountain are lava, flow pyroclastic, falling piroklastika, volcanic avalanches and lava sediment. The position of the young Mount Gede that grew between the two eruption centers in the south-eastern and southwestern parts (Mount Gumuruh and Mt Masigit-Pangrango) caused the spread of most of the eruptions to spread to the northeast and only a small portion to the southwest. The material of Mt Gede Tua activity (Mt Gumuruh – Sukaratu (?) Group, can be observed on the eastern slopes of Cianjur area in the form of 777 hill spread.The 777 hill is allegedly caused by a severe eruption accompanied by landslide and then deposited in the form of small hills. which took place at G. Galunggung (ten thousand hills, van Bemmelen – 1949). The formation of the body of Mt old Gede (after the above event) is a lava flow, can be observed on a fairly high slope like Pr. Culamega (east, 1652 m dml), ​​Pr. Gombong papag (south, 1785 m dml) and Curug Cibeureum (north, 1650 m dml). The old lava flows to the south cover the southern Sukabumi area and reach the valley of Cimandiri Mountain, while the east reaches the Citarum valley. Mount Gede lava composition of andesite hypersten augite vitrofirik until andesite augite hypersten. A number of basalt-composed rocks are found on the northern slopes of Mount Pangrango. Mt Gede produces an andesitic lava flow from a primary tholeitic magma source at the depth of the Benioff zone 120 – 125 km.